This topic has 8 replies, 4 voices, and was last updated 2 years, 8 months ago by 12aklabs. This scenario involves a squad hasty attack, and will require you to conduct a combat estimate, analyzing the relationship between your position, enemy forces, and the terrain. The combat estimate is given and explained in ‘Contact! 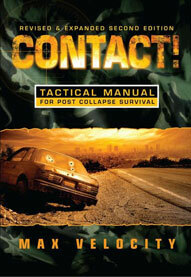 : A Tactical Manual for Post-Collapse Survival‘. This will be a mental combat estimate for a hasty attack. In the scenario, you are already under contact and need to work a solution and implement it as an effective plan. For this training exercise, first time, you have the luxury of being able to sit down and do a paper estimate, approaching it in slow time as a mental training exercise. What you are looking to do is analyse the factors, the mechanistic relationship between them, in order to produce a plan. The plan is a mechanistic sequence of actions/movement/applied firepower/terrain, that will allow you to achieve the mission, using the assets you have available. Look at approaches – left, center and right. Advantages and disadvantages of each one as it relates to the approach itself and the relationship to the whole, in particular the relation of enemy/friendly positions and the impact on fire support and the assault. Just remember that although you have the time to analyse and plan this, in the scenario you are under contact and are limited in terms of intricate solutions. You are effectively going to be initiating a drill, by giving very brief QBOs (Quick Battle orders). There is no real time for a huddle and squad brief. The best you could do would be a huddle, in cover, of team leaders, to give QBOs. At their briefest, QBOs consist of a series of shouted commands: who is giving covering fire, who is moving, left or right flanking etc. I say the above to make the point that although I want you to sit down and work through a combat estimate to come up with a plan, it should not be too complex, nothing that could not be implemented on the fly, on the ground. You do, however, have the training and SOP battle drills of your squad to help you. Please post your solutions here. This is not a test or a competition and there is no deadline. Later, I will put up some example scheme of maneuvers in map/diagrammatic form, to show you some options that would be achievable. Location: 32°38’46.12″N 116°47’8.01″W. Route 94, San Diego County. 5.5 miles north of the Mexican border. General: Some time after the disintegration and Balkanization of the former United States of America, you are the leader of a volunteer border protection team, based in San Diego County. You are part of a larger volunteer force that acts as an auxiliary to the overwhelmed Southern California Border Patrol (SCBP). Your role is to protect the area from hostile incursions by Mexican cartels, seeking to expand their influence into the area and destabilize. You are a paramilitary team, uniformed in OD Green BDUs, with distinctive VBP (Volunteer Border Patrol) logos on the sides of your green SUV’s. Your team has received good training in light infantry tactics, which is vital because the current conflict has deteriorated to open cross border insurgency, small unit on small unit. Specific: It is 1000hrs on a clear day, good weather and blue skies. Responding to a call for assistance from a farm under attack, you and your team are driving east on Route 94, through the hills to the east of San Diego. You are a three vehicle convoy in unarmored SUVs, each vehicle containing one of your four-man teams. . You come under heavy small arms and RPG fire from a hilltop some 200 yards south of the road. Your posture and ROE are aggressive, and your team immediately stops, dismounts the vehicles, and begins to engage the enemy. At this point, none of your people are wounded, and none of your vehicles are destroyed. A couple of inbound RPGs miss their targets, one overshooting and another detonating short. Your vehicles stopped in the roadway are now ‘bullet-magnets’ and are taking multiple hits. Your team has exited the vehicles and is in cover along the roadside verge. Enemy fire is reasonably accurate and the first thing you must do is win the firefight to gain the initiative. You try to call in the contact via VHF radio to request QRF and air support, but there is no response. You are in a communications dead spot in the mountains – you are on your own. As the squad leader, you must make the next move. Enemy Forces: You estimate the enemy at around 6 personnel hidden in the rocks and scrub of the nearest hilltop. You have not observed fire from any other location and it appears to be an isolated group (see map). The enemy has at least one machine-gun. The usual profile of the cartels is to be equipped with similar weapons to the border patrol, and you suspect you are facing a SAW (5.56 belt fed automatic weapon), AR/M4’s, and at least one RPG launcher. The enemy are usually well equipped with adequate ammunition and military training. Friendly Forces: You are a 12 man squad, organized into three teams of 4 men, corresponding to the vehicle crews. Team Alpha 1: Squad leader (You), 3 x riflemen. Team Alpha 2: Team leader, 3 x riflemen. Team Alpha 3: Team leader, 2 x riflemen, 1 x SAW gunner. Weapons: you have standard AR15 style 5.56mm semi-automatic battle rifles, firing M855 green tip, SCBP issued. Despite it being against regulations for VBP members to have automatic weapons, you have acquired a SAW from a cartel team you captured, and a blind eye has been turned towards your possession of this weapon. Smoke: you have 2 x signal smoke canisters per team, one white, one red. Pen flares: each team has a pack of green pen flares, which can be seen in daylight. Note: this exercise is about identifying routes/locations on the ground and sequencing the assault – teams to task. Do not over-complicate it, it is not a trick question. Note on vehicles: these are not really supposed to be used, it is just a scenario to get you on the ground, to do a dismounted hasty attack. However, if you want to use them, it is all learning. Remember: they are unarmored SUVs. Just remember, you will only be able to see what you can see from your position, and what you can infer from your map. When you are looking at this for this training purpose, you have the luxury of going into Google Earth, looking at aerial views, and even ‘running’ the ground in the ground view option (minus vegetation). Solutions will not be published in comments. Send me an email with a map and I will give it it’s own post, as per the Gweru Airfield planning problem. Questions and discussion are OK for comments, not full solutions. Thanks. I’ll give it a shot. I am sure this is not in format you want but I hope this conveys my decision process. Combat estimate- enemy on high ground to south. Some cover for all three teams on edge of road. 1. First win the fight using all 3 teams. Enemy at 12 o’clock 200 yards rapid fire. 2. Hasty flanking attack to the left (east). Alpha 1 & 3 will be fire support. Alpha 2 will flank attack on left using draw to the east. Why? Better cover for attacking team and they will be above or level with enemy when contact is made. The west ( right) draw is below the enemy and the attacking team will have to fight up the hill. Further the initial approach has very little cover on right. 3. Alpha 2 will peel left behind dead ground (can use smoke if necessary) and make approach to line of departure at right angle with fire support. Will attack when in position. 4. Alpha 1 & 3 will provide fire support. Once Alpha 2 is in view and closing on enemy. Alpha 1 & 3 will shift fire to right. 5. Secondary communication for shift fire will be whistle blasts and or pen flare fired at enemy by Alpha 2 leader. 6. Once Alpha 2 has secured the enemy position, squad leader will decide if additional maneuvering is warranted depending on known enemy and if additional enemy position is located. Assault cycle. 7. If no additional enemy detected. Will send Alpha 3 to consolidate with Alpha 2 on objective. Alpha 1 will provide security at vehicles. Once Alpha 3 is on objective, 3 will provide over watch using SAW. Alpha 2 will search bodies and collect weapons and equipment. 8. Alpha 2 & 3 will then move by bounding over watch back to vehicles for exfil. I have questions, if Alpha 1&3 are providing fire support are they bounding up the hill using what ever cover they can find while Alpha 2 is flanking left up the side of the hill until in position to engage the enemy? When Alpha 2 engages the enemy Alpha 1&3 shift right while Alpha 2 takes the hill correct? I was looking at the map and what if the enemy breaks and heads back over the crest to escape which Alpha would or could engage them? Alpha 1 & 3 are behind cover on the road providing fire support. They are not bounding anywhere. The only team moving is Alpha 2. Once Alpha 2 assaults and is getting close to the fire of Alpha 1 & 3, Alpha 1 & 3 will shift fire to the right catching any enemy running from Alpha 2 (squirters). Ok I see now A1 & A3 are keeping them busy by staying under cover firing while A2 is is getting in to position to engage on the left plus any break and makes run back over the crest towards a getaway vehicle on the road to the rear on the map. Thanks..
Don’t memorize it just yet. Let’s wait til Max reviews it, he may shitcan the whole thing. I’m learning too. All of the directions (N, S, W, E, right, center, left) are from the viewpoint of the team leader in Alpha 1. Enemy ambush from the hilltop to the south of Hwy 94 at a distance of approx. 200 yards. Number of enemy estimated at 6. Friendly forces: 12 man squad in 3 teams. Weapons of friendly forces: AR/M4, SAW, Smoke, Pen flares. Mission: Hasty attack to kill or capture enemy and weapons. Winning the fight: Alpha 1, 2 and 3 will disembark vehicles. Alpha 2 will take cover behind a group of trees to the right. Alpha 1 will take cover in the roadside ditch. Alpha 3 will take cover behind a group of trees to the left. All three teams will engage the enemy with rapid fire then switch to deliberate fire keeping the heads of the enemy down. After consulting the map, the team leader has decided on a hasty attack using cover and concealment and dead terrain to mask the approach. Looking East (to the left of the 3 teams) there are two draws/ravines. Advantages: The furthest ravine/draw has both cover and concealment (dead terrain). The closest (smaller) draw may have some dead terrain. Disadvantages: Both draws/ravines to the left have no cover or concealment from the FUP to the enemy position. Disadvantages: Has no cover or concealment. Advantages: Has both cover and concealment (dead terrain) up to the FUP (forming up point) and up to the enemy position. Disadvantage: Dead terrain to the team leader. Also, this maybe a harder uphill climb as the ravine/draw maybe steeper then indicated. Getting into position may take longer. Approach: Alpha 1 and 3 (SAW) will remain in position to provide fire support to Alpha 2. Alpha 2 will move from its position in the trees on the left, using cover and concealment to the ravine/draw to the right. Alpha 2 will move up the ravine using dead terrain/ground to the forming up point just across to the right of the enemy position. Alpha 2 will shot off a green pen flare to signal Alpha 1 and 3 the start of their attack. Alpha 1 and three will then shift fire to the left as Alpha 2 fights through the enemy position. Once Alpha 2 has successfully fought through the enemy position go to ground and signal Alpha 1 and 3 the position is secure. Alpha 1 will then bound in pairs up to join Alpha 2. Once there the team leader will assess the situation, treat any casualties, redistribute ammo, search and clear both enemy dead and the objective. Alpha 3 will provide fire support if necessary and also security of the vehicles. Once the reorganization has been completed. Alpha 1 and 2 will by bounds move back down the hill to their vehicles. Once there they will exfil and continue patrol.